Number cruncher: Rany Jazayerli’s analytical approach has added a whole new dimension to the world of professional baseball. 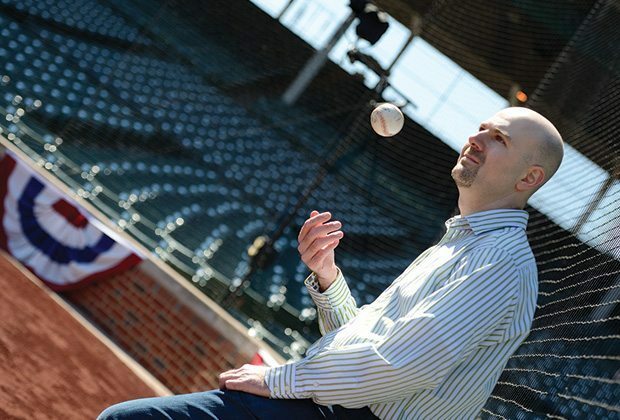 When Rany Jazayerli ’95 was just 6 years old, he asked his dad for a copy of The Baseball Encyclopedia, a 2,500-page tome stuffed full of statistics. He devoured it. As Jazayerli’s childhood unfolded—he grew up in both Saudi Arabia and Wichita, Kansas—he attended only one major league game, when he saw his beloved and beleaguered Kansas City Royals play at Royals Stadium. Plenty of baseball-obsessed students have studied at Hopkins over the years, but few are able to make baseball an integral part of their professional lives. Jazayerli is the exception. In 1996, he became one of the founding writers of the Baseball Prospectus, the compilation of baseball articles and statistics that has become the fantasy baseball player’s go-to reference. Since then, he has regularly contributed baseball analysis and opinion to ESPN.com and Grantland; created his own blog, Rany on the Royals; and continued to write for the print and online Baseball Prospectus. And, oh yes, he also manages his own dermatology practice in suburban Chicago. “I’m kind of an accidental writer,” Jazayerli admits. “I started writing about baseball because I was frustrated with the way the Royals were run, and pretty soon I’m writing for a national audience. It’s not something that I planned to do.” Given the demands of his medical career and his growing family (he has four children under the age of 12), most of Jazayerli’s writing occurs between 9 p.m. and 2 a.m., long after the children have been tucked in. Jazayerli was still in college when an analysis he wrote, of minor league pitching prospects, caught the attention of Gary Huckabay, another bulletin board poster with an idea for a book on baseball statistics. The first Baseball Prospectus, printed without a formal publisher on white stock paper, was released in 1996, while Jazayerli was in medical school. The annual publication is now in its 19th edition. The first Baseball Prospectus coincided with the baseball world’s growing interest in sabermetrics, the mathematical and statistical analysis of baseball espoused by writer Bill James and practiced perhaps most famously by Oakland Athletics manager Billy Beane, the subject of Michael Lewis’ book Moneyball (which was also made into a 2011 film). “The greatest success of that statistic is that it has basically rendered itself obsolete,” he adds. Some baseball fans still critique sabermetrics as reducing the game to numerical odds, but Jazayerli argues that statistics can add a deeper dimension to baseball. The numbers are what drew him to the game in the first place, he says. But he’s also moved by the history and inclusiveness of baseball.